Will 5 billion people perish from the earth in the coming century? That’s what the controversial elitist think tank, the Club of Rome, predicted back in 1972. Decades after its publication, advocates of world government are still pushing its predictions as a call to curb mankind’s footprint on the earth. Australian physicist Graham Turner has recently made news again after revisiting computer models MIT researchers created for the Club of Rome’s 1972 publication that sees a drastic decline in human population coming in relation to a increasing scarcity of resources. Turner’s basic conclusions, however, give away the agenda in plain sight. “The world is on track for disaster,” he bluntly states, while suggesting that “unlimited economic growth” is still possible if world governments enact policies and invest in green technologies that help limit the expansion of our ecological footprint. 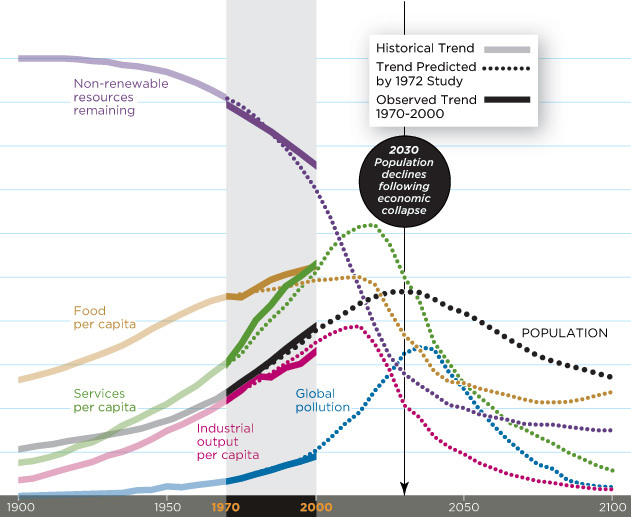 Of course, the Club of Rome/MIT models already predicted that the tipping point for disaster would come by the year 2000, which, like the predictions from Sir Thomas Malthus that population would outgrow the food supply, never came. Instead, this prediction for disaster reflects aspirations of the elite to stop growth, not a neutral reflection on trends that must be. As we have repeatedly documented, the ruling elites aim to cull the population and drive a post-industrial society that harkens back to the feudalistic era. “The motive for this deception, Peccei contends, is purely an altruistic one. Apparently, the “nobel lie” provided necessary shock treatment” to compel nations to adopt measures of population control (Executive Intelligence Review Special Report, p. 16, 1982). In a critique of The Limits to Growth, Christopher Freeman characterized the MIT group as a collective “Malthus with a computer” (Freeman p. 5, 1975). The Club of Rome’s Limits to Growth model, like Paul Ehrlich’s Population Bomb, was meant more to shame the public out of their consumption pattern more than it was meant to be a literal prediction. Thus, “confirming” the model produced by MIT remains a confirmation of the intent to curb society’s behavior– conveniently through a world government mechanism. This is the basic aim of the United Nation’s Agenda 21 and other “sustainable development” programs. They hinge on excitement over the depletion of resources, but many assumptions are made that either prove inaccurate, or that rule out the adoption of alternatives. Consider the fact that even mainstream outlets like Bloomberg have had to concede the myth of peak oil, with new discoveries and existing sources making a mockery of claims that the fuel would disappear. Whether or not oil will remain desirable over alternative fuels is a different question, but current sources can easily last the world hundreds of years. Instead, as Alex Jones and Paul Joseph Watson exposed back in 2005, the ruse is put forward to condition society for artificial scarcity. Cutting off the average human’s access to crude is quite different than its actual availability. Moreover, as Forbes online points out, the Club of Rome study has been constantly updated, and moreover, the current “confirmation” dismisses the use of any real alternatives. The possibilities are there, but have the elites chosen not to embrace other solutions? Why? To account for substitutability between resources a simple and robust position has been taken. First, it is assumed here that metals and minerals will not substitute for bulk energy resources such as fossil fuels. So if we’re not running out of metals and minerals but we are substituting metals and minerals for fossil fuels then the idea that actually, the Club of Rome were quite right looks a bit odd, doesn’t it? The availability and affordability of food is being challenged not by the ability to grow and supply, but by speculators driving up costs. Biofuels, namely corn-derived ethanol, are exacerbating this dilemma by dedicating acreage to fuel-over-food production, threatening billions with potential starvation due to bad policy. Further, GMO crops have been heavily pushed on the illusory promise that they will provide more yields. But the failure of these crops to produce more food will cause a greater disaster by destroying traditional agriculture via costly terminator seeds that have already proved so costly they are triggering one of the largest ongoing epidemics of suicide in India the world has ever seen. The availability of clean water is challenged by many factors, but among them is the widespread contamination with pharmaceuticals and estrogen-mimicking compounds like Bisphenol-A, which have become ubiquitous in consumer life yet oddly are connected with the growing problem of infertility, as well as a spike in cancers, deformities and gender bending in both human and wildlife populations. Again, the elite are driving these policies. The claim of humanity’s potential to over-consume at “unsustainable” levels is not without merit, but it lacks serious focus when it immediately blames the masses instead of those calling the shots. MIT’s calculations in the Limits to Growth publication are thus a bit fuzzy for these reasons and numerous others. It’s not that man is unable to destroy himself that is disputed, but instead it is clear that the oligarchical tier of humanity is bent on achieving the destruction– of the bottom 80% of the world’s population. And that is simply not recognized. The strategy is mirrored by Bill Gates, as demonstrated at his 2010 TED talk. There he contrives a formula predicting collapse unless mankind curbs population, energy consumption, services and CO2 output. “Probably one of these numbers has to get pretty close to zero,” Gates quips, hinting at population numbers as the key variable. The elite want to frame the debate around trade offs in a zero-sum game, ultimately suggesting the negative worth of human individuals. True innovation could get us out of this dilemma, but would those in power entertain such notions? There is a strong case to be made that the issuance of trillions of dollars in debt over the course of the last several decades, much like oil, will become impossible to sustain. Since the entire system of consumption is essentially based on this debt, if confidence in this system is lost, it may very well have the same initial effect as a peak oil breaking point. Debt, even when fabricated out of thin air, is essentially a promise tied to some sort of resource. It is based on the idea that something will eventually be created by someone in order to make good on the debt. By all accounts, we the people are the collateral for all of this debt floating our in the system. But, it has gotten to the point that the debt – somewhere in the range of $200 trillion in the United States alone – far outweighs our ability to harness enough time and energy to repay the principal with interest.